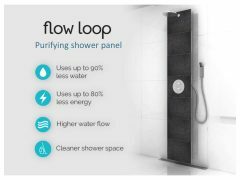 Flow Loop is a plug&play retrofit shower panel that can recover, purify and circulate water directly from the existing shower floor. By circulating shower water, a higher flow is provided, and at the same time water and energy consumption is reduced by about 80%. Competing systems require expensive and extensive installation of a new shower base in order to circulate water from a reservoir. This makes Flow Loop much more affordable and accessible to households who do not plan to renovate the entire bathroom. Flow Loop can reduce a household’s total energy use for heating by about 20% and reduce total water consumption by close to 30%.